At Hanover County Public Schools, we address the needs of infants through preschoolers with programs designed to promote school readiness. We plan lessons to help every child reach his or her potential. Our available programs include Early Childhood Special Education, Hanover Preschool Initiative, and Infant and Toddler Connection of Hanover. Early Childhood Special Education provides specialized instruction and related services to all children ages 2 through 5, who qualify under the Individuals with Disabilities Act (IDEA). ECSE ensures the provision of a Free and Appropriate Public Education (FAPE) in the Least Restrictive Environment (LRE) to all children who are found eligible at no cost to their families. The LRE means children with disabilities receive services in community-based environments whenever possible, and only receive services in a more restrictive environment when their individual needs require it. Services are based on an Individualized Education Program (IEP) which is developed in collaboration with HCPS staff members and the parents of each child eligible for early childhood special education services. If eligible, HCPS provides a continuum of special education instructional services. HCPS provides ECSE services within children’s homes, community preschools, and through classrooms located within our elementary schools. Class-based ECSE services are language-based with an emphasis on motor, cognitive (pre-academic), communication, social and emotional, and adaptive skills development. 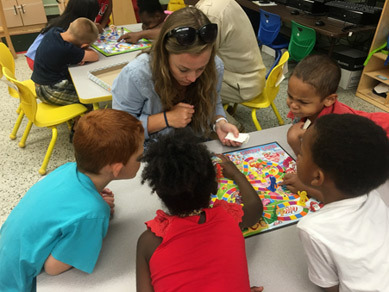 Some of our early childhood special education classrooms provide the opportunity for young students with disabilities to receive specialized instruction alongside their typically-developing peers. This model is referred to as, Reverse Inclusion Pre-K (RIPK). For more information regarding RIPK, please visit our Early Childhood Reverse Inclusion Pre-K Program page. Learn more about Early Childhood Special Education in Virginia. The Hanover Preschool Initiative Program is an early childhood development program open to three- and four-year-old children who meet eligibility requirements. We have designed this program to promote a child's school readiness skills and social competencies through attention to health (medical, dental, and mental), education, family support, community collaboration, and parental involvement. Head Start and the Virginia Preschool Initiative fund the program. Located throughout the county, the Hanover Preschool Initiative has nine classes, each staffed with a teacher and an instructional assistant. The program is funded to serve 159 children. Eligibility for the Hanover Preschool Initiative is based on the age of the child, income of the family, and other at-risk factors. Guidelines require that the program reserve ten percent of its spaces for preschoolers with disabilities. For more information please visit our Hanover Preschool Initiative page. Parents are often the first to know when their baby needs a helping hand. The first three years of your baby's life are very important. Infants and toddlers are learning to walk, talk, recognize people and do many other things. Parents are often the first to notice when their child is not learning or growing like other babies. We are here to help. The Infant and Toddler Connection of Hanover (ITCH) delivers services that are child-centered and family-focused in a natural environment to children with developmental needs, from birth through age three. Families wishing to find out more information about Early Intervention Services, please visit our Infant & Toddler Connection of Hanover page.